When talking to homeowners about going solar, you’ve likely heard many of them voice concerns that were based on misconceptions. Unfortunately, there are a number of solar myths that still thrive today, despite solar technology having become far more established and well-known. Solar contractors should take this issue seriously. Believing myths about solar panels and solar energy is one of the big reasons why many homeowners decide against solar, or never bother to look into in the first place. If you can do your part in dispelling these myths, you’ll be building a future in which more leads are educated and confident about going solar. In this post, we take a look at some of the top solar myths and the facts you can cite to debunk them. This is probably the most common myth out there. The truth is, solar panels are powered by daylight, not heat. It doesn’t matter if it’s cloudy, rainy, or cold, the panels will still convert that daylight into energy. Ironically, solar panels actually perform best in colder temperatures. This is because high temperatures (91° F+) hinder the efficiency of the solar panels, preventing them from producing as much power as they normally could. It’s true that solar panels can be a big investment for some homeowners, which is why ROI is such an important consideration. Homeowners want to be sure they’ll save enough money on energy costs to justify getting solar panels. The good news is that solar savings potential has been steadily rising. At the current rate, homeowners can cover the installation cost within 6 to 15 years. If a homeowner takes advantage of financial incentives, it may only take 2 to 4 years. They can also get a nice ROI when they sell their home, since solar panels can bump a property’s sale price up by as much as $15,000. It’s easy to understand why this is commonly thought, but the nation’s prioritization of solar energies has actually spurred most states to adopt some sort of solar incentive program. Additionally, the federal government offers financial incentives for residents no matter what state they live in. To dispel this falsehood, make sure you don’t leave a meeting without letting homeowners know about the specific incentives available in their state, as well as the current federal programs. Yes, it’s true that solar tech is advancing, making it increasingly cheaper and more efficient. However, these gains aren’t expected to be that dramatic in the coming years. If homeowners wait to install, whatever they may potentially save on installation costs is offset by what they don’t save on energy during that waiting period. Additionally, certain financial incentives are available for only a limited time. This is because the government wants people to make the shift to sustainable energies sooner, not later. For example, the federal government is currently offering a 30% tax rebate for residents who install solar panels before 2019. By clearing up these misconceptions when you meet with homeowners, you’re setting yourself up for more successful sales. If you’d like to do more to improve your sales process, you can also start seeking qualified solar leads. With leads whose validity and seriousness has been checked beforehand, you can make sure you only meet with homeowners who are ready to buy. 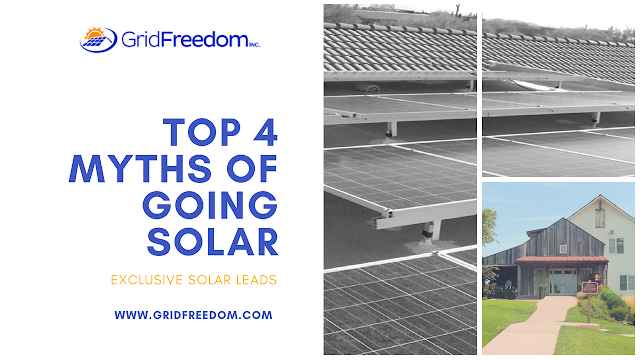 Here at Grid Freedom, we offer exclusive solar leads for contractors that are qualified by our expert team. Learn more by visiting www.GridFreedom.com. I love this concept! I want to get off the Grid. Who do I talk to to get a system for my house and finally stop paying the utility company by getting off the grid?